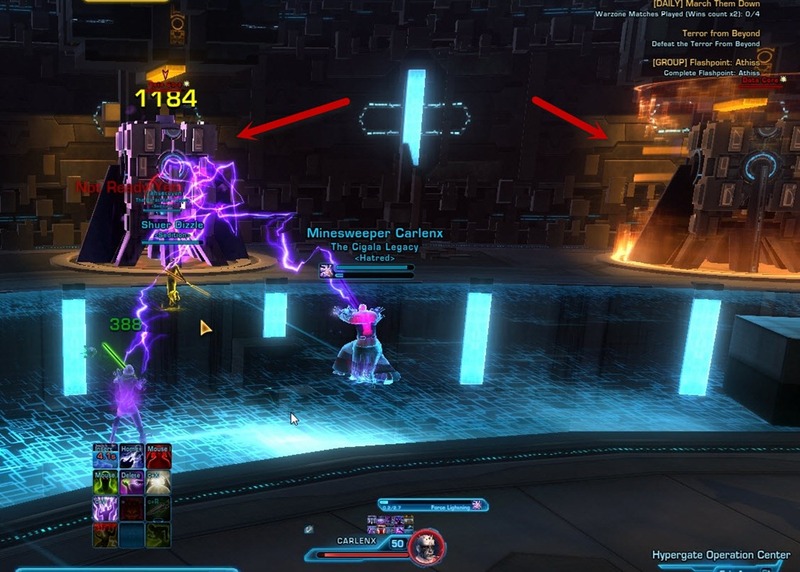 This is the boss strat for Operator IX, the third boss in SWTOR Terror from Beyond Operation in Patch 1.4. Included are strats for storymode with hardmode coming shortly. Color coordination Match every DPS with a tank or healer. Then each DPS +tank/healer pair pick a color. Phase 1: Central circle color The pair with the same color as the central circle undernearth Master Control will need to split up. 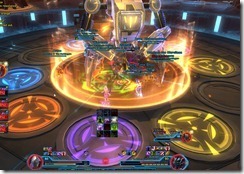 The tank/healer stands inside the central circle while DPS channel at a console to unlock two datacores that can be attacked. You have 70 seconds in each colored phase to kill the two datacores (additional adds may spawn if you don’t kill them within the time limit). Phase 1: Recognizer adds/Regulator Recognizer adds will come running to attack the pair standing in the central circle or channeling at the console, a tank should remain to tank them. One regulator add will come instead of the Recognizer add when you destroy the last 2 datacores. Phase 2: Black Obtuse Players will need to find their colored circle within 10 seconds while Operator IX casts Black Obtuse. This fight on storymode is very relaxing and tests your coordination skills rather than throwing out big damage numbers. color A, B, C, D could be any of the four colors provided: blue, purple, yellow and orange. Once everyone has picked, you will end up with something like this and ready to start the fight! In phase 1, you will want to keep an eye on the Master Control in the middle, especially on the circle he is standing on top of. When that circle turns into one of the four colors, the healer/tank of that color will need to run to the circle and stand in it. 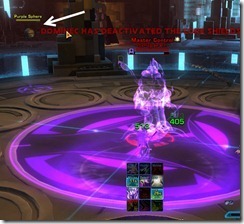 The DPS of the pair will need to run to one of the console activated nearby and channel it. This will unlock two data cores on the outer rims of the room. 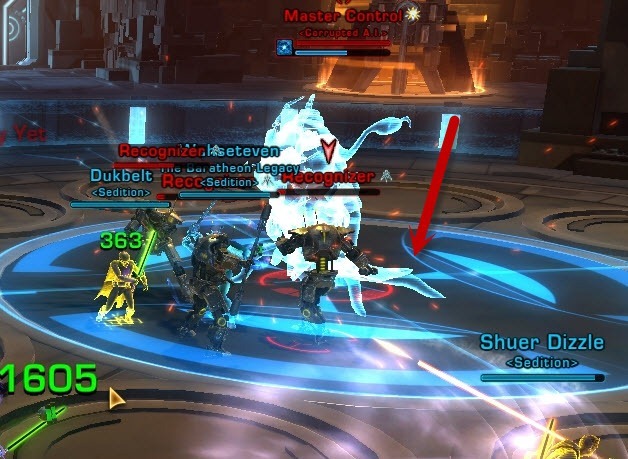 You will want to keep a tank healer/combo near the Master Control as there will be some Recognizer adds come running by to attack the person channeling the console. These adds have very little health and can be killed quickly. 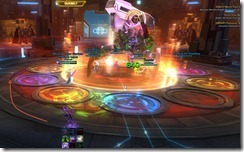 Rest of the raid can run to the Data Cores to attack them. There will be two Data Cores activated per color pair. They tend to be on opposite sides of the room but you run slightly faster inside the room. When you are down to the last two data cores, you may get a Regulator add instead of the regular Recognizers. He has slightly more health. Phase 2 gets slightly more exciting. Master Control will disappear and Operator IX, a giant droid, will show up. Operator IX will announce periodically, Operator Response timed out, Please Repeat and start casting Black Obtuse, a 10 second channel. While he is channeling, the small circles around him will have colored circles and each person of the pair will need to run to the appropriate colored circle within 10 seconds. It is recommended that you do not stand in the smaller circles when fighting and do not run through them during the Black Obtuse stage. Running through the wrong colored circles may cause that circle to disappear, screwing other color pairs. In storymode you can get away with it. In the event that one player of a specific color pair dies, the remaining player of that color will need to run to both circles during this stage. Operator IX may have an aggro during/after Black Obtuse so tanks will need to taunt right before he finishes the channel. This fight on hardmode is tightly tuned and is a lot of fun. 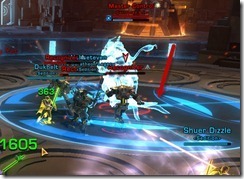 Enrage timer is 5:55 – 6 minutes on Operator IX (phase 2). Phase 1: Timer on killing data cores. Blue: 70 seconds, Orange: 60 seconds, Purple: 55 seconds, Yellow: 50 seconds. Failure to kill both datacores within the time limit will cause the Master Control to repeat that color (giving you time to kill the datacores) but also spawns a Rectifier and any adds in that phase. 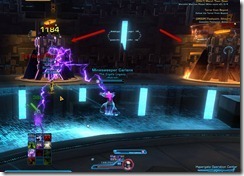 Phase 1: Rectifier Rectifier have a conal attack and must be tanked away from the raid. Phase 1: Adds Both orange and yellow will spawn 2x Champion adds called Regulators while blue and purple only spawn Recognizers. You want to make sure you kill the datacores in orange and yellow phase in a timely manner if possible. Phase 1: Color spheres Everyone must kill a color sphere of their color to get a buff for phase 2. Phase 2: Disinfection Disinfection, a 19k hit (close to one shot) to a random player seems to be some sort of aggro wipe/attack on the player with the 2nd highest threat. Occurs after Black Obtuse. Phase 2: Color Deletion Protocol The person called out for color deletion have a circle underneath them that the raid member with the respective color have to run to in order to “protect” them. On storymode, all the colored circles are given a 70 second window to kill both datacores. This is not the case for hardmode. The trick to know the time remaining on each colored phase is to have the Master Control as a focus target. This will allow you to see his cast bar. You have will plenty of time to kill both datacores on blue phase but the subsequent phases might be close. You should aim to kill both datacores within the time limit for Orange phase as well as that will make the encounter slightly easier. 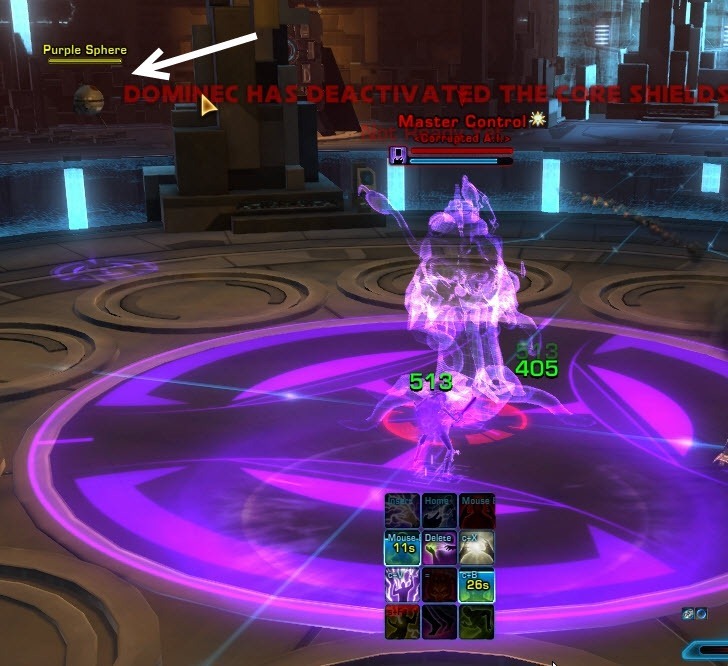 Tip for killing datacores: DPS killing datacores do not need to move back to thecenter after a color phase is over (unless their color is called). Instead, they can stay at the destroyed datacore and datacore that will be unshielded next is either to the left or right. This can shave off a few of those precious seconds. It is not always bad to fail the time limit and for some phases like purple you may actually fail the timer on purpose to clean up the adds (explained below). Not killing the two datacores for a color phase within the time limit will cause the Master Control to repeat that color phase (giving you more time to kill the datacores) but there there are two consequences. 1) Rectifier Spawns (you will get the following message on screen: Failed to Achieve Red Obtuse. Activating Green Bisector). 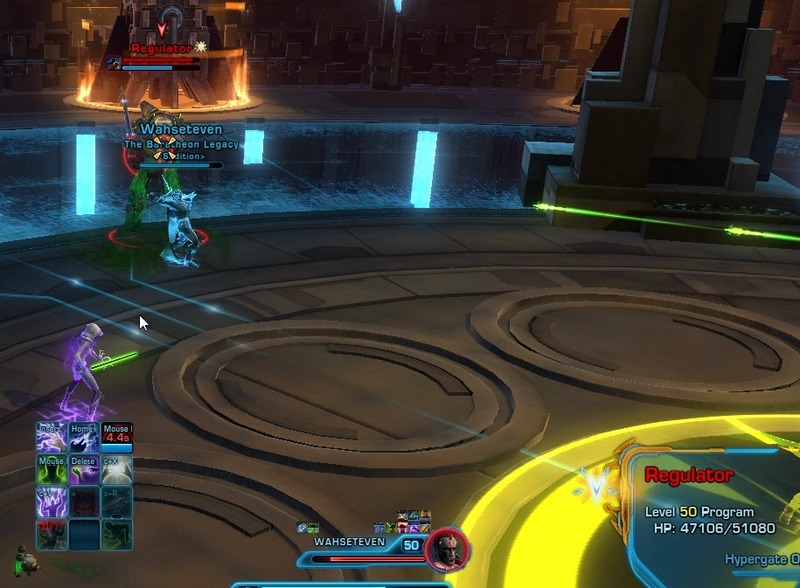 Rectifier has 90k HP and a very nasty conal attack so he should be tanked faced away from other players. 2) Any adds that spawn during that color phase will spawn again (i.e. if you repeat orange phase for example, you will get two more champion Regulators. If you have to repeat a color phase, you want to do it on the color without the Regulator adds. Blue and Purple phases only spawn Recognizer adds, these have very low HP (15K) and doesn’t do a lot of damage (i.e. mostly harmless). Orange and Yellow phases spawn 2x Regulator adds. These are champion level mobs with 70k HP and cast a spell called End of Line, which is a knockback. For this reason, they should be tanked well away from the central color circle and the person channeling on the console. The second Regulator will spawn about 10 seconds after the first, giving you sometime to DPS down the first. 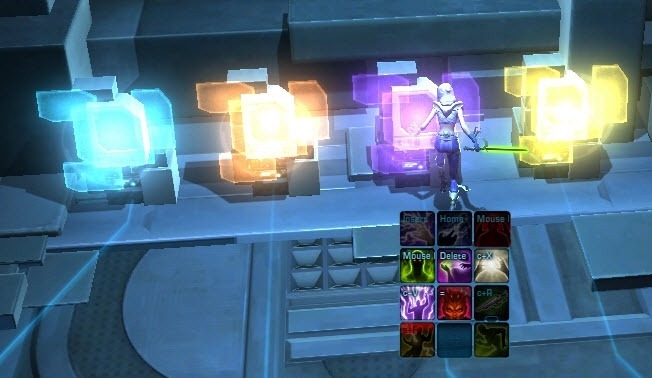 To help burn down the Regulator adds quicker, we have the tanks within each tank/DPS color pair to channel at the console (the other tank grab both Regulator adds). This allow the DPS in the middle circle to help burn down the first Regulator. We tend to repeat the purple phase on purpose to give us time to clean up the Regulator adds from the yellow phase. When repeating this phase, we have all the DPS burn down the Rectifier and Regulator adds first before running back to the data cores to finish the purple phase. 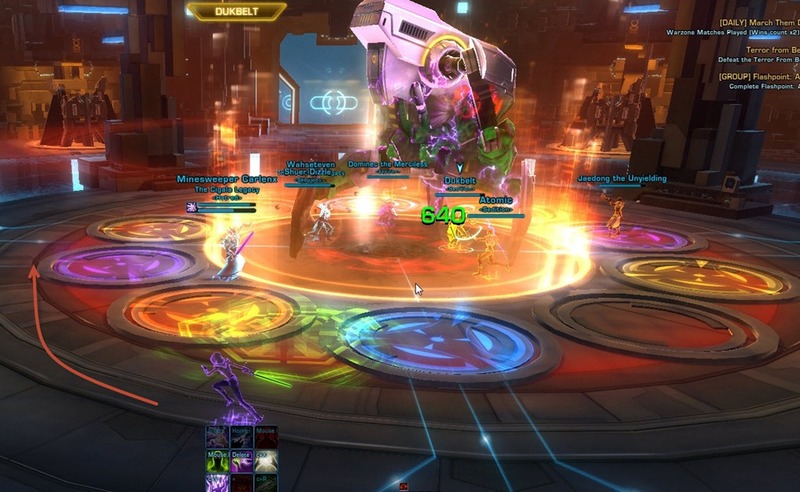 The reason we picked purple is because 1) only Recognizer adds spawn 2) 55 seconds is fairly tight and you don’t want to waste your DPS cooldowns and have nothing for the subsequent yellow phase. Depending on your DPS, you may repeat the Yellow phase (last colored phase of Phase 1). If this happens, make sure you kill the Rectifier and Regulator adds first before killing the datacores to end Phase 1 or otherwise you will bring these adds into Phase 2 with Operator IX. During each color phase, two color spheres of the corresponding color will spawn. Each person of the same colored pair will need to grab one and kill it to receive a buff. Players not of that color will need to avoid damage these spheres and accidently killing them (they only have 5K HP). For example, during the purple color phase, two purple spheres will spawn. The two players with the purple color will need to each grab a sphere and kill it individually to receive a buff called Purple Obtuse. This buff is crucial for phase 2 and not getting that buff may cause you to wipe on that phase. These color spheres of the previous color do not despawn when you transition into a new color, as long other players don’t accidently kill them. Black Obtuse on hardmode is only 8 seconds (storymode is 10 seconds). This means that all the players should stack in the middle with Operator IX as that offers the shortest travel time to their circles during Black Obtuse. Operator IX may have an aggro drop during Black Obtuse so tanks need to make sure to taunt him near the end of his channel. This is a 19k hit on a random player shortly after Black Obtuse and before Color Deletion Protocol. The cause of this attack is not certain but it was theorized to be some sort of aggro wipe/attack on person with the second highest threat. Disinfection can be rendered mostly harmless by having both tanks fighting for aggro immediately during and after Black Obtuse. This strat seemed to focus most of the Disinfection on tanks. Color Deletion Protocol comes after Operator IX finishes channeling Black Obtuse. 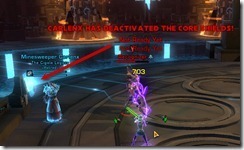 One random member of the raid (name will be announced in red text) will be targeted for deletion by a specific color. The person with that color buff will need to run to that person (who also have a corresponding color circle undernearth them). Doing so will protect them from the deletion protocol. You have 5 seconds to do this. Since there are two players with the buff for each color, make sure you sort out who does the “protect” first as to not waste both buffs. 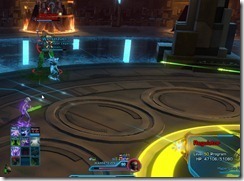 If both players run in to protect, both of their buffs will be used up (see picture below). Make sure that the player targeted for deletion stand still and those without the corresponding color buff to protect that person move away. If this guy doesen’t cleave, each pair could stand of opposite sides of the boss in phase 2. Taking the closes circe and making it faster and easier for each player to find their circles. good point however 10 seconds was pleanty of time for my guild to goof around and find our circles. is the cast faster in HM? also the enrage timer is very lenient in story mode for this fight. 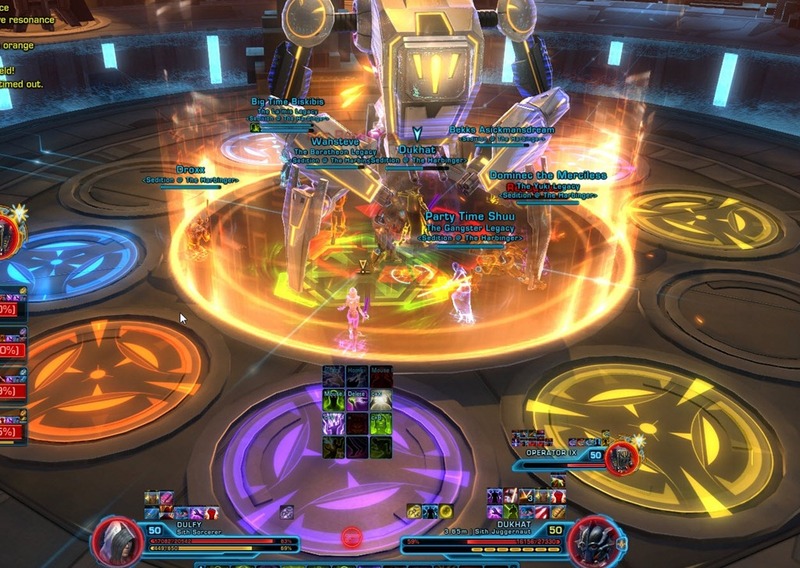 we started the fight, killed the first adds, and we basically stood there trying to figure out the fight (the tank didnt stand in the middle circle) for about 2 minutes dealing no dmg to anything and still killed the final boss in this fight without hitting a enrage. From what I saw, at the start of black obtuse, Operator gains a stacked buff, I didn’t catch the name. Hitting the circles with the proper color will clear a stack of the buff. The damage done, corresponds to the number of buffs he has. In hard mode we had 4 regulator droids spawn on the second colour. What causes this to happen? you didn’t kill both datacore within 60 seconds and the phase repeated? We keep getting killed by master control with corrupted A.I. towards the middle of the first phase – any idea what’s causing this and how to stop it? We had our assassin tank try that. All that happened was that she was knocked out of stealth and into combat the minute she clicked the switch. Ok about this switches… i am able to press them, and after I press them we can pass the room without killing the core inside. And I can do the same with the next rooms as well. Do you know if you get an achivement if you kill the boss with the cores alive? I know this is alot to ask but i love the gear the merc bekks is wearing in that video. Do you mind asking him/her what it is and posting it here? Thanks for the vids you’re the best! Thats a link to a video guide that I did for this fight. let me know what you guys think. I have one coming for Kephess as well! Our raid has been having an issue with Disinfection in HM, and I think I’ve figured out the mechanic for it. It all comes down to making sure people do not run over the wrong colors during Black Obtuse. This effect protects you from disinfection. If you get hit with Disinfection and you have 2 stacks from clearing both circles, you take ~4k. No biggie. If you get targetted by Disinfection and you have fewer than 2 stacks, you get hit for ~19k and will probably die. I think Disinfection is RNG based, our 2 tanks haven’t had much success figuring our taunt timing. So everyone having 2 stack of their Convex is crucial. tl;dr –> Don’t run through other people’s circles in Black Obtuse, they need them to survive Disinfection. Does anything change for this operation (HM) in the 2.x update? My guild cannot seem to get past Operator IX in HM at all. We’re geared up with mostly 69s and some 72s. Thanks!! Hey thanks Dulfy for all the great guides. I’m wondering if you’ve noticed any significant differences in this encounter since you made the video. I Heal for it and I’m plenty geared, and the tanks I run with seem to be geared as well, but it appears like the silver “recognizer” mobs do about 300x more damage than they did in the video. I watched and you guys just seem to derp around while you’re killing them, like they’re just sorta in your way. With two geared tanks and a healer, I have no time to help dps them because I’m sitting there trying to keep the tanks alive while they taunt the adds. Running a PUG we don’t have enough dps on the cores to run two healers in the middle (one has to dps the cores). Have they changed significantly since the vid? What would you suggest? Hmm with the change to L55 the mobs do hit a bit harder. I havn’t noticed the recognizer mobs doing significantly more damage though, it has being those regulator mobs that are hitting hard. I take it there is no DPS in the mid to help killing them? Nope. Obviously coordinated guild runs with geared and intelligent people things would be smoother, but running a PUG where anything can happen, I tend to steer all DPS to the cores or else they don’t go down in time. We run two tanks in mid and one healer, sometimes the tanks have enough AoE to take out the mobs, but if there’s a Guardian tank I’ve found that for whatever reason they can’t focus down the mobs faster than they’re spawning. By purple phase the tanks will have about 3 silvers and a gold on them each, and by then it’s essentially unhealable. I noticed the Recognizer change because sometimes they’ll aggro to me and hit me for about 1/4 of my health each time (obviously as a sage healer they’re expected to do more, but not THAT much). Perhaps I’m not paying attention too well and it’s actually the Regulators, idk. If the cores fail what would you suggest? Having one tank grab any Rectifier adds faced away from the raid and the other tank grabbing the other adds? Burn smalls then Rectifier/s? Ya that would be my suggestion if you do get rectifiers spawning. 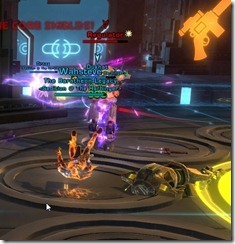 Although it gets really chaotic when rectifiers spawn and someone is bound to get cleaved and die from it. 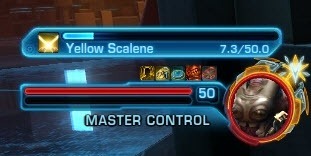 I am surprised that you even need healer DPS on the cores. Havning two healers is really best if your DPS can push out a bit more. Hej Dolfy. I need your help. In phase two. Operator drops ago EVERY time after the shield goes down. And ive tried to taunt him at the end of the channel and after the channel. But i just dont get the agro unless i use both single target taunt AND AOE taunt. If i dont get the ago, operator just turns away and oneshots a random player in the ops groupe.. I dont even know how many tryes we have had on this, it just didnt work at all. It is not a problem with any of the players gear, we are all very close to full 72. Is is just because of that agro drop that oneshots someone from the ops groupe every time. 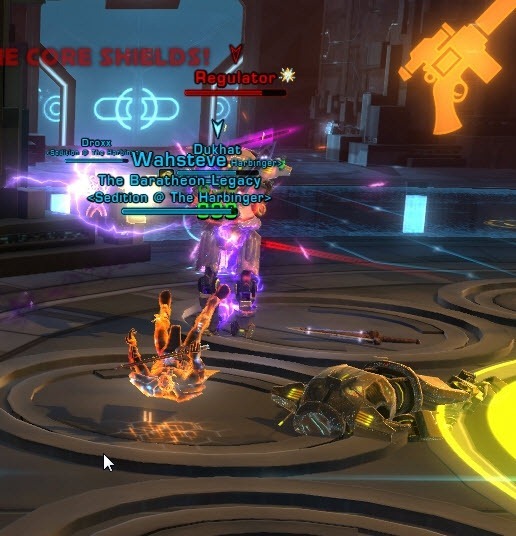 We ofc combat res the guy, but when it happens every time after the shield then we are pretty much scrowed.. I simply dont understand what im doing wrong. In my old guild this never happened, i never lost agro from operator. And ive been doing HM ops for about 2 months and i dont recall one single time where this happened. I would appreciate some feedback and some help/tips to what to do to avoid the agro drop, or atleast the get agro before operator has time to turn away and one shot someone from the ops groupe. Single target taunt is 15 sec and AOE taunt is 45 sec cooldown. The othere tank we have with us is sorta new to HM. He did them long time ago. But he tried it aswell and he lost ago the same way as i did. I never changed target the last couple of trys just to see if operator changes target or indicats to do so.. But nothing. He just canges target 0.5 sec, kills a groupe member and changes back to me.. I dont get it, like i said ive been farming HM TFB and SV and never had this problem before, so its totally new for me this thing with the agro drop. Our tanks said they slowly count to 3 after the color circle phase ended and then taunt Operator IX. Both tanks do that. 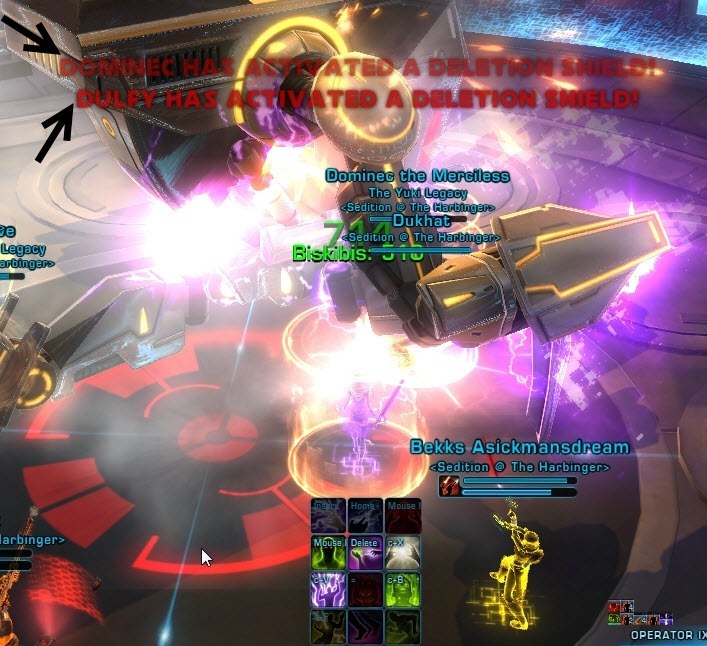 Odd that dulfy got two disinfection in row there at video and died on both…. Anyone know if it’s possible to do Operator 9 SM with 7 people? We’re in a Group Finder run, and want a guildmate to join us, but can’t for 15 minutes and we’re at Op 9.